At the end of August I completed a four day ride from Marble Arch, London, to the Arc de Triomphe, Paris, we have been congratulated by lots of folk on our achievement. Sam, my eldest son, Beth, my daughter, and I cycled over 280 miles, climbed around 9,000 feet over the four days. There hangs a tail – I’d told my daughter there’d be some climbing towards the end of the London-Dover first day, some at the start of the second day and not much after that. Well, between Canterbury and Dover I don’t think I’ve climbed so much on a bike in such a short space of time. The second day was much as predicted but on the third day after a lengthy and gradual ascent and then steep descent, we had the longest climb of the trip so far, which was followed by plenty more shorter ascents. Then on day four not long into the ride out Beauvais we met what turned out to be the longest ascent and followed by several more climbs, prompting Sam to say that the climbing had not been balanced by descents. For the first two days we had decent weather, the third day was torrential and a day when we seemed to be continually cycling into a headwind, the third day started off wet but ended in the sun in Paris. However, facing long climbs in wet and clingy clothing was not what any of us would have described as fun. Standout performances from both kids (if you can call them that at 29 and 23) but we were admirably supported by my wife Ab and son Joe. While, when we started, if we’d known what we were letting ourselves in for, I’m not sure we’d have had the guts to keep going. However, we also had a couple of rest stops on the first two days when we were met by Ab and Joe, who provided us with much needed refreshment. On the third and fourth days our lunch stop also turned into a major recovery break, with a complete change of clothes at lunch on day three. Ab drove, Joe navigated and, I’m sure also calmed Ab’s nerves. He also provided the food for lunch, his own inimitable gourmet sandwiches, together with soup, cake, coffee, etc., though we tended to take too long and eat too much for lunch because of it. They also did the checking in and out of hotels, packing up, etc – regular soigneurs – but not too many massages though, so not sure we can recommend them to Team Sky just yet. On day three the change of clothes was significant, swapping next to useless cycling rain capes for climbing anoraks. None of us had waterproof pants, so it was a change from sodden lycra to dry lycra, which very quickly became sodden again! For some reason it was the wet days when we seemed to hit the roads with the heaviest traffic and it was on day three that we had the only puncture of the trip. Just lovely replacing an inner tube on the rear wheel in the pouring rain! 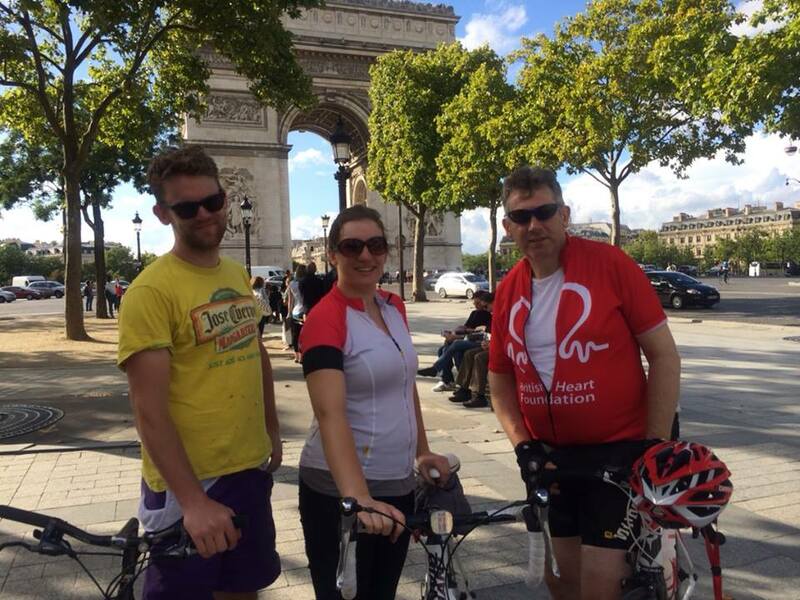 As the three riders all had intermittent knee problems, the support team provided medical support, all invaluable and without which we would have struggled to complete the ride to Paris. We also had support from lots of other sources to help us prepare, many thanks to all. Elaine many thanks for your tips, including encouraging us to ride on each others wheels to reduce the overall effort we put in. We had practiced a little before but definitely got better as the days passed, with Sam and Beth both doing some immense work at the front and nobody ever being left behind. We didn’t take arm warmers – but the mornings were cold at the start and, yes, it was always a struggle to get going on each morning after day one but being forewarned we managed. This was a goal that had it’s genesis in a minor heart condition, which thankfully was resolved last year – but being clear as to the goal, how we were going to achieve it (putting the plan together), preparation (training, route planning, getting all the equipment in place – which for Sam almost de-railed the trip) and a mass of support, we eventually achieved what we set out to do. We used a Garmin and ridewithgps.com for route planning – if anyone wants to use my files, speak to me and I’ll help you keep off the farm tracks – which are not ideal for road bikes and how we got our puncture on day three!